Todd Verlon Edgar, died Wednesday, July 16, 2003 at the age of 32. 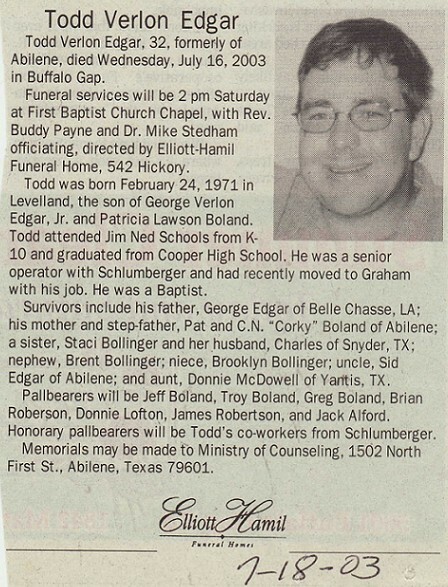 Todd was born February 24, 1971 in Levelland, the son of George Verlon Edgar, Jr. and Patricia Lawson Boland. Todd attended Jim Ned Schools from K-10th grade and graduated from Cooper High School. He was a senior operator with Schlumberger and had moved to Graham with his job. Survivors included his father, George Edgar of Belle Chasse, LA; his mother and step-father, Pat and C.N. Boland of Abilene; a sister, Staci Bollinger and her husband Charles of Snyder, TX. Pallbearers were Jeff Boland, Troy Boland, Greg Boland, Brian Roberson, Donnie Lofton, James Roberson and Jack Alford.